History: Papa Bear resembles a big white bear—almost all white with a few fawn spots speckled down his back. 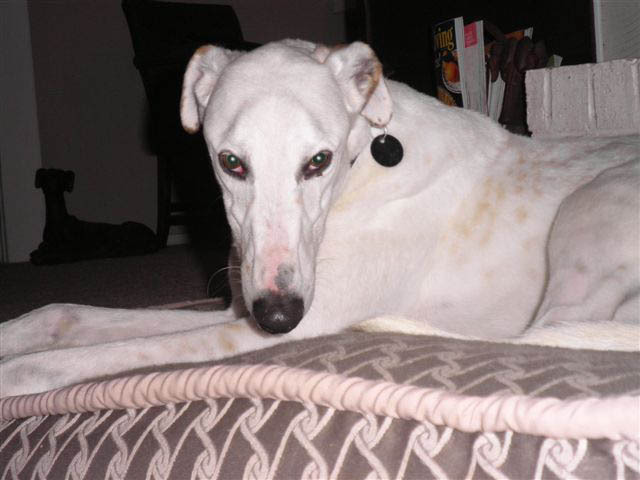 He has beautiful dark lined eyes and speckled ears. Although Bear has a prestigious pedigree, apparently he had no desire to race or was not proficient enough to make it at the track. He’s a very affectionate, friendly boy, learning about his new environment. Bear crates well and his house manners are progressing. Bear and his new family, Steve, Keri, Chris (Jordan not there) and Savannah, the Beagle. 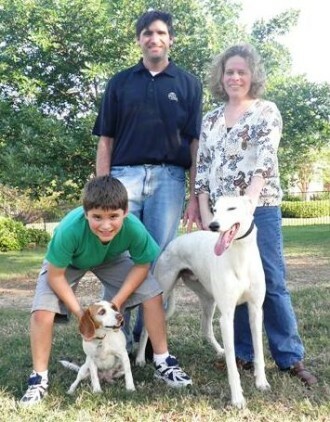 May 6, 2011 update: Adopted! Bear is only 2 years old, but you would never know it. He is ssssooooo laid back. Occasionally he’s curious about what is on the counter or kitchen table, but “no” goes a long way with him. He’s learning to sit. The other day I caught him sitting by himself (and there wasn't even any food around). The boy is definitely food motivated. He found very early that toys are entertaining – especially if they make noise. They don’t hold his interest very long, however. A minute or two with a toy and he has to lie down. He does like to run around the yard with the other dogs and tries to incite them to play. If he doesn’t get any takers he moves on. Frequently I see him lying on the sidewalk or in the yard. He’s fond of the Sphinx position and does not stay on his feet for long. Bear is crated during the work day but sleeps in the bedroom on a dog bed at night. He seems to have no issues with any of the other dogs. He’s learning to “steer” when on a walk but is not a puller. This is a “go along to get along” guy. Affection and a soft place to put his head are his priorities (after food, of course). 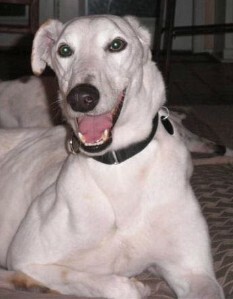 He is what you would consider an “easy” greyhound. 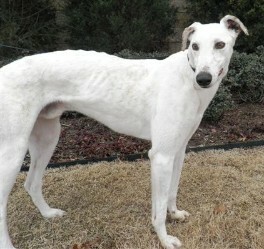 Bear is a most handsome greyhound with the thickest, softest fur. The number one comment from people is how soft his fur is. Visit Bear in person. Those beautiful brown eyes will melt your heart.